The City and County of San Francisco quietly put out a Request for Proposals (RFP) for the Stow Lake Boathouse last spring for a new leaseholder to open an indoor / outdoor café / restaurant at the Boathouse. The three responses received were tabled as none met the primary requirements. On December 7th, 2009 a Request for Quotation (RFQ) was issued that requests a conceptual plan for capital improvements and operation of the concessions. This item is on the agenda on Thursday, December 17th at 2pm at City Hall, Rm. 416, when the Recreation and Parks Commission meets. The week before Christmas is no time to decide the fate of such an important part of Golden Gate Park. Has an environmental impact report been done to evaluate the impact on wildlife and human users, increase of traffic, etc? Park users concerned that the historical usage of the boathouse and character of the Boathouse be preserved, as the City searches for ways to increase its revenues, the Save Stow Lake Boathouse Coalition was formed. The Coalition is collecting signatures on petitions both online and at Stow Lake. 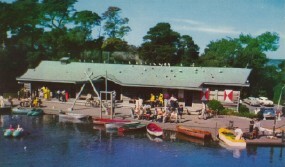 The joy of taking a boat ride around Stow Lake is an experience many of us have enjoyed since childhood, with generations of families taking their children and visitors for a ride under the bridges and around Strawberry Hill and then indulging in snacks at the snack bar, like pink popcorn. The storybook character of the Boathouse attracts all ages and all ethnic groups to it, every day the weather permits, seniors who come for walks and chats while enjoying a cup of coffee or ice cream, regulars who row around the lake, school groups who come for the birds and to enjoy an affordable snack at the snack bar…all part of the special community at the lake who come for a respite from our over commercialized world and to enjoy the wildlife and flora of Stow Lake. The historic preservation and repurposing of the Beach Chalet with restaurants and a museum, is a magnificent example of how the City can maintain its heritage and increase revenues. The Beach Chalet was abandoned, falling into decay and attracted crime. The Stow Lake Boathouse is not abandoned, it does not attract crime and the only decay of the facility is caused directly or indirectly by City mismanagement. Since the City put the current leaseholder on a month-to-month lease, he has been unable to afford the costs of repainting, maintenance or upgrades, including adding electrified boats. The current lease has been held in the same family since the early 1940’s. The current tenant has painted the Boathouse several times, maintaining the historical colors, at great cost to themselves. Now, the Boathouse needs paint and capital improvements including structural engineering and foundation work as water is seeping in from Stow Lake. The City says it has no funds for these repairs. The Save the Stow Lake Boathouse Coalition proposes that the City work with the current lease holder to be sure all needed repairs are done, first and foremost by extending the current lease at least 10 years to make necessary repairs possible so that the character and architectural exterior of the boathouse remain the same and to keep running the “old fashioned” snack bar & boat rentals. The current tenant has never had a boating accident and has many long-standing, excellent relationships with customers. The current tenant has employees that have worked there for over ten years and those jobs should not be endangered. The current tenant has added healthy food options to the snack bar menu and is interested in adding additional items to increase revenue and wants to repair and improve the facility once a longer term lease is in place and the City should provide support to this dedicated tenant to make these necessary repairs. Do we need another restaurant in Golden Gate Park when there are already 3 food concessions immediately adjacent: 1 in the de Young, and 2 in the Academy of Sciences. With the multitude of 9th Avenue restaurants nearby… does this really make sense… and where else can you row a boat in the middle of the City and enjoy pink popcorn? Let’s preserve it for all generations to come.